Jahlil Okafor&apos;s rookie season with the Sixers has gotten off to a fine start on the court, where he&apos;s averaging 17.5 points and 8.2 rebounds through his first 18 games of the season. But off the court, it&apos;s been a complete disaster. Okafor was caught on video throwing punches outside of a nightclub in Boston, and that caused the local media to begin looking around to see if that was an isolated incident. As it turned out, it wasn&apos;t. Okafor had gotten into a previous altercation that resulted in a gun being pointed at his head, was pulled over for driving over 100 MPH, and was caught trying to get into a Philadelphia bar using a fake ID. So not surprisingly, the team is taking control of the situation, according to a report from ESPN&apos;s Chris Broussard. 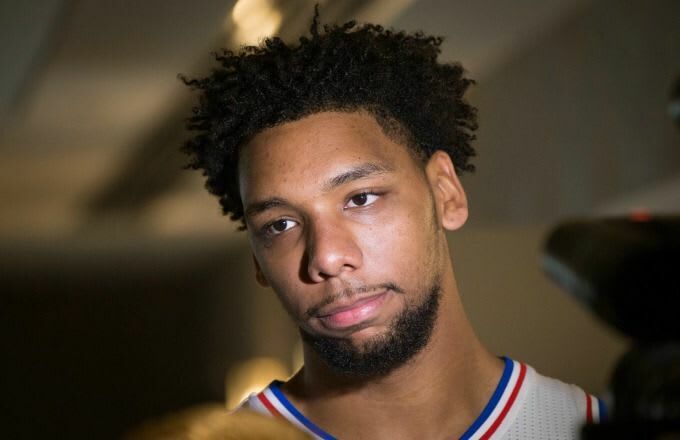 After being involved recently in a few embarrassing and potentially dangerous off-the-court incidents, Philadelphia 76ers star rookie Jahlil Okafor will now be accompanied by a security guard whenever he goes out, according to league sources. The request for security came from Okafor&apos;s handlers, who asked the 76ers to make a security guard available to their first-round draft pick out of Duke. The Sixers did not return a phone call seeking comment, but two sources said the club will honor the request. The request had to come from Okafor or those close to him, because an NBA team has no right to impose a full-time babysitter on one of its players, no matter how much trouble they&apos;ve gotten into recently. But based on all that&apos;s gone on with Okafor during his first two months in the league, you can bet that team officials initiated the discussion.